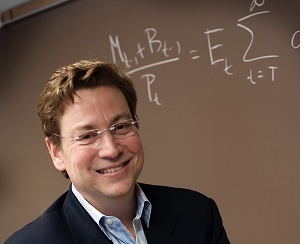 Eric Leeper is the Paul Goodloe McIntire Professor in Economics at the University of Virginia, a position he began in 2018. He is also a Research Associate at the National Bureau of Economic Research, director of the Virginia Center for Economic Policy at the University of Virginia, an external advisor to the Swedish central bank, and a member of the Research Council of the Bundesbank. His research focuses on theoretical and empirical models of macroeconomic policy, with special emphasis on monetary-fiscal policy interactions. One line of work focuses on a new mechanism—called the “fiscal theory of the price level”—by which fiscal policy can influence economic activity and inflation. Recent research examines the economic impacts of government spending, the macroeconomic consequences of alternative resolutions to long-run fiscal imbalances, and the modeling of the “fiscal limit” and sovereign risk. Leeper received a Ph.D. in economics from the University of Minnesota in 1989 and a B.S. in economics from George Mason University in 1980. Prior to joining the faculty at Virginia, Leeper spent 23 years at Indiana University and eight years in the Federal Reserve System. Leeper was born in Isfahan, Iran, and spent his school-age years in Taiwan, Malaysia, Seattle, Hong Kong, and Northern Virginia. In coming years, Leeper’s research will focus on the policies that allowed the United States to recover from the Great Depression and on a project with the International Monetary Fund to quantify fiscal limits across countries.